Club house, Royal Cork Yacht Club Queenstown. The Royal Cork Yacht Club has the distinction of being the oldest yacht club in the world, for the earliest documents connected with it date as far back as 1720—’ Rules and Orders for the Water Club of the Harbour of Cork.’ These rules, which were first printed in 1765, are very quaint, and throw an interesting light on the manners and customs of our ancestors nearly two centuries ago. Apparently the club in 1720 consisted of six members only, whose names are given in the rules—viz., Lord Inchiquin, Hon. James O’Bryen, Charles O’Neal, Henry Mitchell, John Rogers, and Richard Bullen, chaplain. In 1760 there were only twenty mem­bers, although twenty-five was at that time the limit of member­ship; but the club must have been in a flourishing condition at that time if we may judge by the two paintings in the possession of the Royal Cork Yacht Club, one of which represents two yachts belonging to members of the club, and the other the fleet proceeding ‘a few leagues out to sea,’ led by the Admiral. These pictures were painted by Monamy in 1738, and the latter contains some dozen vessels beating to windward after the Admiral. Curious-looking vessels these are, with short bluff bows, brightly painted and gilded, lightly rigged as cutters, with pole masts, short gaffs, rather long booms, short bowsprits considerably steeved, and without bobstays or bowsprit shrouds. They had very little standing rigging, and the simplest possible running gear. The Admiral flew a Union Jack at the masthead, whilst the others flew long streaming pen­dants, and all, Admiral included, had a Union Jack on a staff on the bowsprit end and an ensign on a staff stepped on the taffrail, the latter a not very handy arrangement in working short tacks. How the club fared after 1765 is unrecorded, but it would seem to have diminished in prosperity, for in 1806 a few gentlemen agreed to revive it, and were successful in doing so, albeit to a limited extent; and, after existing for a century, it was all but extinct in 1821. 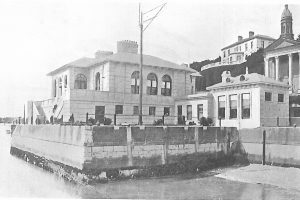 However, in 1822 a small club, called the Little Monkstown Club, was formed, and in 1828 these two clubs were amalgamated under the title of the Cork Yacht Club. Two years later (in 1830) the prefix Royal was granted to the club, and three years later the privilege of free access to all French ports was bestowed upon it by the French Government.In the ‘Rules and Orders’ to which reference has been made, the secretary is ordered to ‘prepare an Union Flag with the Royal Irish Harp and Crown on a Green Field in the Center.’ The season is arranged with the utmost simplicity : ‘Ordered, That the Water Club be held once every Spring Tide, from the first Spring Tide in April to the last in September, inclusive.’ It is also ordered : ‘That no Admiral do bring more than two Dishes of Meat for the Entertainment of the Club ‘; and another resolution checks his prodigality in liquid refreshment: ‘That no Admiral presume to bring more than two Dozen of Wine to his Treat ; for it has always been deem’d a Breach of the ancient Rules and Constitutions of the Club, except when my Lords the Judges are invited.’ This seems to indicate that the judges of those days were of a singularly bibulous nature. Vanity was also curbed to some extent: ‘Ordered, That no long-tail Wigs, large Sleeves, or Ruffles be worn by any Member at the Club.’ A manuscript note, however, stated that this rule was to be abolished. To talk of sailing after dinner involved a fine of a bumper, and every member was bound, on pain of expulsion, to entertain in course of seniority. Indeed, so largely did conviviality bulk in the proceedings of the club that it was mere prudence to resolve ‘That all Business of the Club be done before Dinner, except appointing the Time of the next Meeting, or presenting, mulcting, and levying fines.’ Fines of one English crown were levied on owners failing to send their yachts to any meeting, this money going to provide gunpowder for the use of the fleet. This shows very clearly that the club was intent, not so much upon its feasts, as upon carrying out its cruises, and one of the rules expressly puts a limit upon indulgence in wine, for on April 21, 1739, it was ordered ‘That for the future, unless the Company exceed the number of fifteen, no Man be allowed more than one Bottle to his Share, and a Peremp­tory.’ What a peremptory was must remain in doubt—probably a drink of good-fellowship which none might shun. The headquarters of the club was Hawlbowline Island, and whether it actually belonged to the members or not, it is certain that they assumed sovereignty over it. The club flag was ordered ‘to be hoisted on Club days early in the morning, on the Castle of Hawlboline,’ and the ‘Knight of the Island for the Time being’ had certain duties of stewardship to perform. The Admiral (the Royal Cork, the Squadron and Mudhook are the only British clubs the chiefs of which are styled Admirals) had greater power. He, or three ‘captains ‘ appointed by him, had to decide all dis­putes, non-acquiescence in any ruling involving expulsion. A foot­note to this rule expressly includes the chaplain in its scope, ‘or any other inferior Officer.’ No person was permitted to land on Hawlboline Island on any club day without the Admiral’s permis­sion. During the cruises he had absolute command, and vessels as they joined the fleet on club days had to cheer him three times ‘if they have not guns to salute,’ and it was a rule that ‘no boat shall presume to sail ahead of the Admiral, or depart from the fleet without his orders.’ Rule 12 ran : ‘That the Admiral of the Day, to be the better distinguished, do wear at his Mast Head a proper small Flag.’ This ‘proper small flag,’ according to the old picture to which reference has been made, was the Union Jack, which, no doubt, had been adopted as the Admiral’s flag early in the life of the club, but in 1759 the privilege was officially granted to wear the embroidered Jack with a device in the centre. This the Admiral of the Royal Cork Yacht Club wears to the present day, and a is a privilege which no other club has ever acquired. The ‘Sailing Orders’ were replete with instructions as to sig­nalling with guns and flags, and a captain could hardly venture on a nip at a ‘Peremptory’ without signalling for the consent of the Admiral. These early navigators were apparently not unacquainted with sea-sickness, for an order runs ‘If a Captain has any Body very Sick on Board him, and wants to go to the Island, he is to make a Waft of his Ensign, to lower his Pendant half down, and Fire a Gun ; if he gets the Admiral’s leave, he will be shewn a white Flag in the shrowds, if not, a Red one and a Gun fired.’ One may vividly imagine the anxiety of the suffering one whilst waiting to see whether the white or red flag should be shown!In common with many other clubs, the Royal Cork has suffered in recent years from the increasing multitude of regattas, in the hurry to attend which the racing fleet is apt to disregard its fixture. Nevertheless it provides ample sport for its members, and possesses all the virility which has kept it so long prominent.